Blanton Lee McGee was born Sept. 3, 1984, in Austin, Texas, and died Aug. 26, 2012, at St. Alphonsus Regional Medical Center in Boise, Idaho. 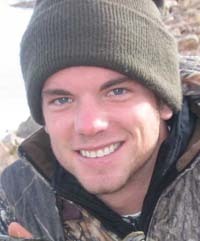 He had been a resident of the Ketchum/Sun Valley/Hailey area since November 2007 when he moved here to work for Pete Lane’s River Run and managed Dollar Mountain in the winter and then worked at Lost River Outfitters in the summer. A year and a half ago, he went to work for Scott Sports in dealer services and viewed his co-workers as extended family. He was a fly fisherman, hunter, skier, hiker and biker, and enjoyed all outdoor activities. This past summer, he played on a Ketchum coed soccer team and the Scott volleyball team. Blanton graduated with a Bachelor of Arts degree from Colorado College in Colorado Springs, Colo., in spring 2007. While there, he majored in cultural anthropology, was a member of Kappa Sigma fraternity, was a two-year letterman and starter in football and was active in the International Club. Also he was an Eagle Scout and traveled widely, including studying abroad in Spain. He is survived by his parents, David and Judy McGee; brother, Jonathan; and sister-in-law Crystal from Athens, Texas. Also, he will be missed by his aunts, uncles, cousins and his many, many dear friends in this area. Any friends wishing to remember Blanton, consider a contribution to the Animal Shelter of the Wood River Valley, Box 1496, Hailey, ID 83333 or Wood River Land Trust, 119 E. Bullion St., Hailey, ID 83333.